Sweet food does not always presented in the Chinese food, except in the event official. Fruit salad is certainly quite special. 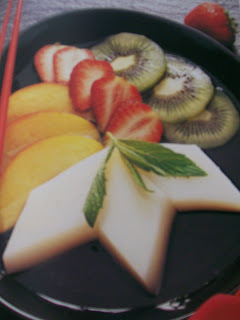 Fresh fruit such as kiwi, mango, pineapple, banana, lici, or Satsuma orange, peach, berry, cherry, grapes, or star fruit. 1. Take gelatin in cold water for 10 minutes, or until resembles spons. Place in large mixer bowl. 2. Boil 185 ml water, and enter the sugar. Add to mix in the gelatin and water, slosh and sugar until gelatin dissolves. 3. Add milk, 1 tsp almond essence, and if you like the coloring substances. Poke to the average, and take into a mold the size of 20 square cm. Make cold in the refrigerator. 4. Mixed sugar and water to make syrup in a pan. Cooked in the fire small until the sugar dissolves. Keep it and boil for 2 minutes until slightly thick syrup. Add almond essence and let it cool in room temperature. Take in the refrigerator until ready to use. 5. Prepare the fruit, place and set the trim in the food dishes. Add syrup that has been cold. 6. Cut almond float with the diamond shape or size of 2.5 cm cubes. Use spatula to move it from the mold. Place carefully in between the fruit mixture. Tub with fresh mint leaves before served. Time: Duration of preparation, about 25 minutes almond float takes about 2 hours to become hard. Preparation: To prepare the kiwi fruit, peeled the skin with a sharp knife, then cut thin-round. Lici fresh fruit can be cut round after the seed is peeled.